After arriving back at Melbourne Bioinformatics after 8 weeks of delivering training across Europe, here’s a list of my highlights of training and collaborating. I spent a few days hanging out with the awesome people at the Elixir hub at the Wellcome Trust Genome Campus in Hinxton. We spent quite some time working on some joint proposals for projects between Elixir and EMBL-ABR with Rafael Jiminez of Elixir Hub and Vicky Schneider of EMBL-ABR. I also continued our discussions with the Victoria Dominguez de Angel of the French Elixir node and we came to an agreement for them to use the GVL and some NeCTAR resources to teach their national week long bioinformatics course in the week of July 3rd. Jessica Chung and Nuwan Goonasekera from Melbourne Bioinformatics were instrumental in the provisioning of this infrastructure. They were impressed with the GVL and what it offers them for bioinformatics training and analysis. The training course was a complete success and both the participants and teaching staff were enthusiastic about the GVL. Work continues in the coming months to make the GVL available on the French Institute of Bioinformatics (IFB) cloud infrastructure for use by researchers all over France. I also spent some time discussing GVL options with Frederick Coppens and Björn Grüning of the Belgian and German Elixir nodes (respectively) and have agreed to make the GVL available on their Clouds. Björn will be implementing the availability in July 2017. I was invited by Gabriella Rustici of the Genetics Department of Cambridge University to give a workshop to university staff on Genome Assembly, Annotation and Galaxy. The workshop was an entire day of hands on tutorials for genome assembly and annotation using the GVL infrastructure and training materials. The feedback from the participants was extremely positive and they all learned a lot of instantly applicable skills. Gabriella and Paul from the training department were very happy with the way the GVL training material works and engages the students. They are looking at the adoption of our materials and incorporating them into their ongoing training. 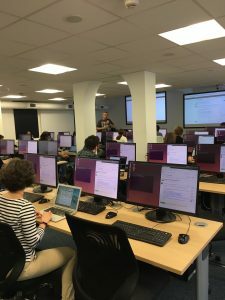 At the microbial hackathon in May, I organised to spend 3 days to a week at the Sanger Institute with the bioinformatics core, teaching staff how to use Bioconda and write tools for Galaxy. So I spent the week with Jaqueline Keen, Andrew Page and John Lees getting Sanger’s very useful tools into Bioconda, Biocontainers and Galaxy. By the end of the week we had put “Roary the pangenome pipeline”, “Gubbins – Genealogies Unbiased By recomBinations In Nucleotide Sequences” into Galaxy via Bioconda and made significant progress on many others including John Lees’ SEER bacterial GWAS software. As each tool was completed, it was incorporated into the GVL and currently training material is being produced for them. I also got to spend an evening in the very beautiful Saffron Walden (an old market town) just near the Wellcome Trust Campus. I was lucky enough to catch the train from London down to Montpellier in France for the Galaxy Community Conference. This conference brings together Galaxy developers, users, trainers and communities together for 5 days of hacks, training and conference. The first two days were called “Hack the Galaxy” and incorporated people from the broader Galaxy community working on the codebase, training material, user interface improvements, test and training data sets. I worked with some of the French participants on getting tools and materials into Galaxy. It was a lot of fun and it did improve my French! Day 3 was a Training day. I taught two workshops and participated in a third. I taught de novo Genome Assembly for about 20 participants in the first session with assistance from Dan Blankenburg from the Galaxy Project. I attended Metagenomic Analysis with Galaxy in the second session, then Nate Coraor, Dan Blankenburg, Martin Čech, Enis Afgan, John Chilton (all of the Galaxy Project) and I taught accelerated Advanced Galaxy Administration. This was taught with material we developed for the week long Galaxy Administration courses held in Salt Lake City and Melbourne in 2016/2017. It was a very busy day. The feedback from the workshops was very encouraging and the participants were again impressed with the quality of the materials we have developed here in Australia. Days 4 and 5 were the conference itself. There were a lot of high quality and interesting talks presented by people from all over the world. I gave a talk on Galaxy Administration Training and had a well received poster on Data Library Manipulation in Galaxy. * Peter Van Heusden of Cape Town University: “COMBAT: an integrated environment for Tuberculosis data analysis and surveillance”. Finally, it was announced that next year’s Galaxy conference will be co-located with the Bioinformatics Open Source Conference in Portland, Oregon. And so my epic journey through the UK and France came to an end. I would really like to thank everyone I visited and who hosted me over the last 8 weeks. We did a lot of work and got a lot of things done for the good of bioinformatics in Australia and elsewhere. Special thanks to EMBL-ABR, Melbourne Bioinformatics, Cardiff University, the Galaxy Project and Elixir for funding the trip. Thanks also to Vicky Schneider of EMBL-ABR and Dave Clements for setting up the interactions. Thanks also to Madison Flannery (ex Melbourne Bioinformatics) who gave me a base to operate out of. Stay tuned for my next blog where I’ll run through all of the outcomes of these interactions and the ongoing collaborations that have resulted from my trip.